How did you come to be the person you are? Who made you? Well, every week we say who made us, or to be more precise, who makes us, and it is God. So, in our Confession, we address God as our maker and our judge. Leaving aside God as judge for now, what does it mean for God to be our maker? I think most people would say that God is our maker in a biological sense – not that God personally fashioned each one of us, but that God made the world, which made us (via our parents), so ultimately, God is our maker. But that’s fairly boring and makes no difference to our lives, so why repeat it each week? There’s a clue to what God making us means in our first reading, in which when the prophet Jeremiah receives a vision in the temple and God tells him that before God formed him in the womb, God knew him. Another way of putting that is before Jeremiah was only a little blob of an egg and sperm joined together, God loved him. It’s saying God’s love for us precedes everything else about us. That’s nice, but we’ve all heard that God loves us. People put that on church notice-boards. At big sporting events Americans hold up signs which say John 3:16 – which is God so loved the world that he gave his only Son. The assumption there is that if you tell people how much God loves them, they’ll become Christian. But the writer of John’s Gospel isn’t talking about how much God loves us. He’s talking about the way God loves us. It means God’s love is revealed and manifested in Jesus’ life, death and resurrection. The true nature of God’s love is not well understood, and today’s gospel story alludes to this. In the synagogue Jesus reveals himself as one who has come to bring God’s love into the world. The congregation are amazed at his words and speak well of him, until he reminds them that people of other races were blessed by God, and are examples of what he is talking about. Then the people in the synagogue become filled with rage and want to kill him. The gospel writer is showing us there’s a disparity between God’s love and something deeply embedded in human beings – not so much individuals, but groups of individuals, for it’s not this and that person, but all the people in the synagogue who turn against Jesus. Right then and there Jesus could have ended his mission. He would have shown the world what it needed to see: that there is something destructive about humanity, something which even drives us to want to kill and yet God still loves us. 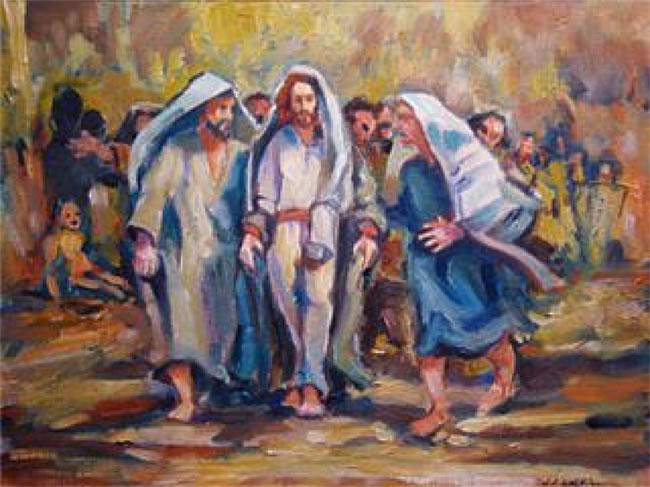 But Jesus didn’t end his mission there, instead he ‘passed through the midst of the crowd and went on his way’. God knows how he did that, but the point is that no-one would have understood him if he finished up there. Like Mahatma Gandhi, who always made sure the press were present when he did anything important, so too, Jesus had to gather witnesses who were close enough to him to be able to understand and experience what he was showing the world. St. Paul was also a witness to Jesus – not quite like his disciples, but for him, by experiencing the destructive aspect of humanity within himself being transformed by God’s love. Hence Paul could write that beautiful passage about love. The key phrase in that could be that without love he is nothing. Without love WE are nothing. There is much in life that matters to us, but if there is no love in it, then it is really of no value. There’s something to contemplate: how much love is there in what I value, what I do and what I say? grasp is how profound God’s lack of envy and how profound God’s lack of insisting on his own way is. Another way of saying that God is not envious of us and does not insist on his own way is that God is not in rivalry with us. God is not in competition with us, God is not against us. But isn’t God against us? Isn’t God in rivalry with us? Isn’t God always wanting us to change our ways? Isn’t that why we confess our sins in church? – because God wants us to change – to not be like we are? Doesn’t God hate our sin? Isn’t God kind and loving, whereas we’re always disappointing God, with our selfishness? Isn’t God always trying to change us into better people, which means that God is in competition with us? Well no actually, because God is love, which means God does not insist on God’s way and God does not wish that we were different. This is the Good News. This is what Jesus’ disciples realised and it changed everything for them. How did they come to realise this? It was by at the same time coming to understand (by having it revealed to them) that we, human beings, are the opposite: we are envious of one another and we do insist on our own way. That is the ‘destructive thing’ I was talking about before. That is what’s wrong with humanity. That’s what sin is and that’s what Jesus saves us from. I won’t go into how he does that here, because I want to return to my original question, which was how did you come to be who you are? There are various aspects to ourselves – our personality, what we do with our time, what our talents are and so on, but at the core of all that is who you are in the world, how you belong, what gives you your significance. That’s what I’m asking about when I ask how you came to be who you are. The answer to that question is not yourself -you don’t get that from yourself. No-one is born with that. It is given to you by others. The trouble is that others – that is human beings in general tend to be envious of each other and like to insist on their own way. In other words, that’s the culture in which we grow up. It is that culture which tells us to be somebody, to make our mark on the world. It’s that culture which tells us that our achievements give us our worth and our failures take it away. It’s that culture which tells us to be like everyone else, or its opposite – to rebel and be different to everyone else (they’re just two sides of the same coin). It’s that culture which tells us there is something wrong with those who are different, or worse, something bad about them. It’s that culture which tells us to compare ourselves to others and that we need to be better than others. It’s that culture which drives us to compete with others and to hold on to our sense of who we are in case we lose it or it’s taken from us. It’s that culture which says those who are too young, too old or not able to do or be like the majority are inferior. I said that we receive our sense of who we are, our sense of worth from others, well there is another other who is completely different, because he not driven by envy or the necessity of having things his way, and that is God. God has no interest in our achievements or failures, no interest in whether we are ‘good’ or ‘bad’, no interest in whether we fit in, are respectable, or whatever. God loves us. At his baptism God told Jesus he delighted in him, and as God is the same towards us, then God delights in us too. That’s how God makes us. God’s delight calls us to be ourselves, so God can delight in us more. Knowing that, is the most important thing to know, for it frees us from being shaped by rivalry and competition. It means everything we’ve been told about what makes us worthwhile that has anything to do with what others think of us, or how we fit into the ways of the world, is irrelevant and meaningless. We are absolutely free to become whatever we have it in us to be. So we come to church, where we immerse ourselves in the Spirit of the One who makes us, the One today’s psalm calls our Rock and Fortress, for nothing can compete with the love which makes us, because it is absolutely non-competitive.